On the 26th of May the I.H.F (International Aid Fund) held an Information Day in Driebergen/Holland. The I.H.F. is a Dutch voluntary organisation which supports worldwide Waldorf school initiatives - for instance by sponsoring scholarships. On that day, the portofolio holders for the different countries informed the public what had been accomplished with their donations. ovies, and also exhibited handmade craft items which could be bought. Despite the fact that we are not memerbs of the I.H.F., Cornelis Boogerd and I were invited to represent Ein-Bustan with a stand. Fundraising is a complex issue. - Making the purpose clear and visible in our Dutch language Newspaper published via the Website of Ein-Bustan. the hundreds tiny white ceramic peace-doves manufactured in a far-off village in Peru. - The lottery. (We never used it). You spend some money for “a good purpose” but secretly you hope to get the millions yourself! The editorial staff of a Woman’s Weekly named “Margriet” was so impressed by the initiative of Ein-Bustan that they offered us an article in their magazine and €1500.-! How we could show these generous spenders that this seed fell in fertile soil? I bought for almost this amount of money from a Turkish greengrocer huge delicious dates from Israel, which he gave me at costprice!We packed them in cellophane and tried to sell them at a Waldorfbazaar. 10 dates for €5.- with the explanation for what purpose. None was sold. AND YOU WILL RECEIVE A BAG of DATES FOR FREE. In a few hours all the dates were “sold” and our income almost doubled. 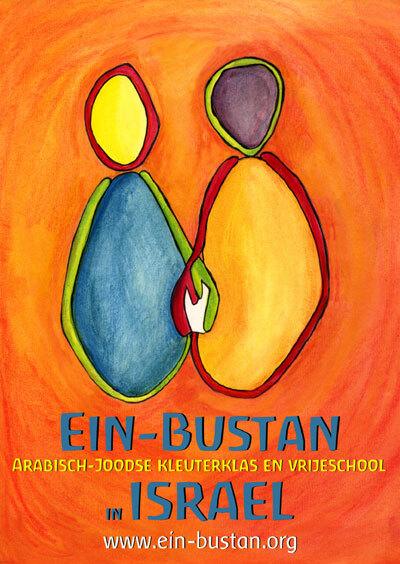 A sixteen year old pupil of the Waldorfschool in Amsterdam, Tara Kuypers Wentink , delighted at seeing the happy faces of the children of Ein Bustan, made an expressive image of the initiative. That lovely poster attracted the visitors to our stand at the I.H.F. day and we hope it will touch the visitors of the Ein-Bustan web-site as well! Fundraising is as complex as people are.